GUTHRIE, Okla. – It was a wild third round of the CINCH Timed Event Championship, and Jordan Ketscher of Squaw Valley, Calif., survived and moved into the lead. The round featured three lead changes, a knee injury to then-leader Erich Rogers that took him from No. 1 to seventh in the 15-run aggregate. Ketscher, who has been one of the most consistent contestants in the field this weekend, finished his five-run afternoon in 56.0 seconds to win the round and add $3,000. He is followed by Trevor Brazile, the only seven-time winner of the “Ironman of ProRodeo;” Cash Myers, the leader heading into the day; Clayton Hass, who was an injury replacement; and Kyle Lockett, a two-time winner. 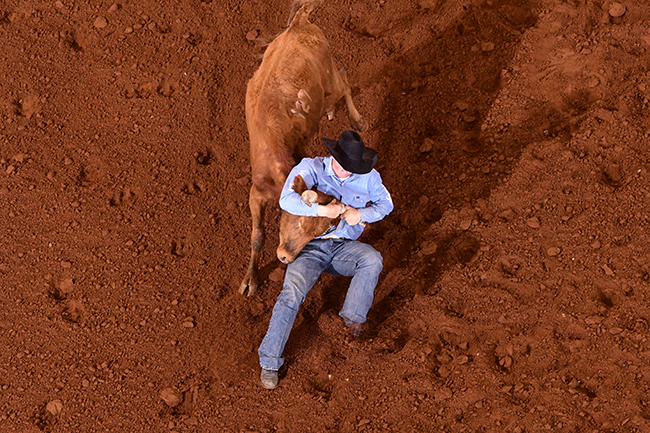 In the Jr. Ironman, leader and reigning champion Bo Yaussi suffered a 60-second penalty in the final event of the day, steer wrestling, and dropped out of the top three. Myles Neighbors of Benton, Ark., won the second round in 42.3 seconds and holds the best cumulative time through eight runs, a 98.2, just less than five seconds ahead of the No. 2 man, Wyatt Hensen of Oakdale, Calif.
Third round: 1. Jordan Ketscher, 56.0 seconds, $3,000; 2. Trevor Brazile, 57.6, $2,000; 3. Clayton Hass, 57.9, $1,000. Average leaders: 1. Jordan Ketscher, 189.4 seconds; 2. Trevor Brazile, 205.6; 3. Cash Myers, 206.6; 4. Clayton Hass, 227.4; Kyle Lockett, 231.9. Jr. Ironman second round: 1. Myles Neighbors, 42.3 seconds, $1,000; 2. Wyatt Hansen, 43.3; 3. J.D. Draper, 49.4. Jr. Ironman average leaders: 1. Myles Neighbors, 98.2 seconds on eight runs; 2. Wyatt Hansen, 103.1; 3. J.D. Draper, 113.2.